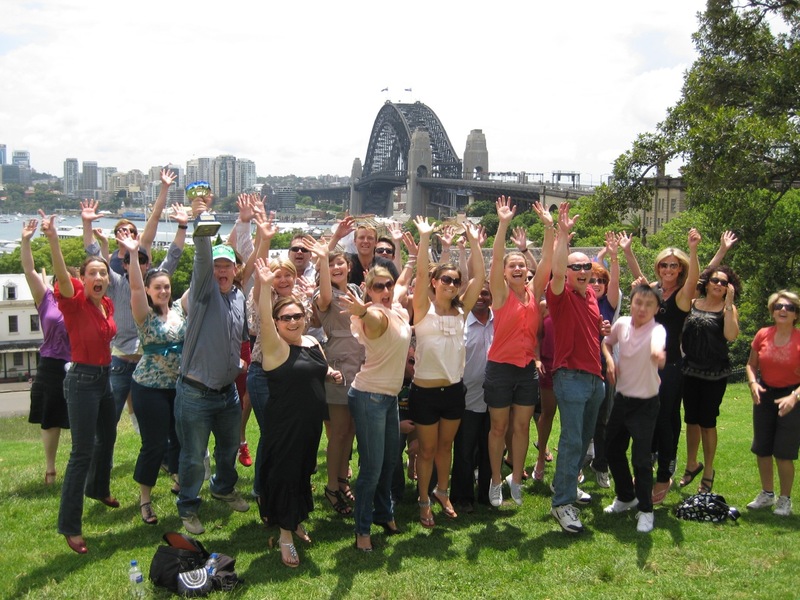 Sydney Amazing Race are fun outdoor events designed for team building activities, corporate groups, businesses and social groups. Experience Sydney, The Rocks, Darling Harbour and Circular Quay on an exciting level. Enjoy FREE offers with Bushsports; leaders in URBAN adventures. Call our outdoor events team now : 02 9871 3333 and have Bushsports design your next outdoor activity event from Colour Runs, Great Races, Team Chases and Race Arounds Amazingly!! 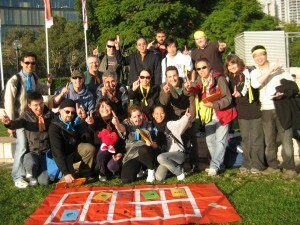 Sydney Amazing Race Activities and Events are fully packaged programs around Sydney. Bushsports is the original provider of Action Packed team building activities and corporate events that are filled with excitement! Sydney Amazing Races are the ideal team building activity to challenge, build, and reward your teams. Or win bragging rights with your friends for accomplishing a bizarre range of activities, tasks and challenges! 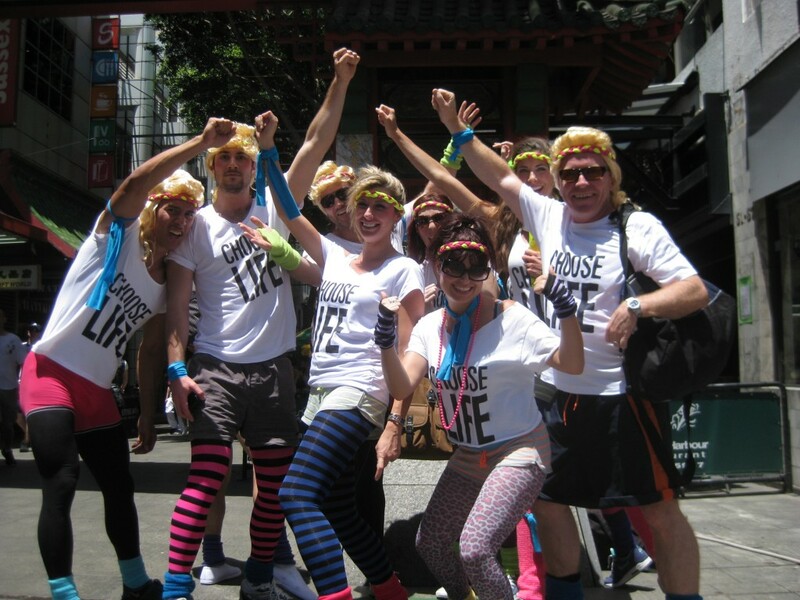 Sydney amazing races ignite the passion of people who CHOOSE LIFE. Team Building with Bushsports is the best fun! 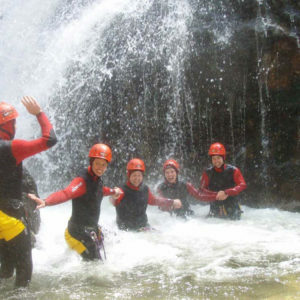 Bushsports is confident that we supply the best fun amazing race activities and adventures since 1972 – put us to the test! An Amazing Race needs to be AMAZING, not a scavenger hunt in disguise. Instead of waiting around for the next amazing race series on TV…. Get outdoors with your staff, colleagues, corporate group and friends to battle it out for the ultimate reward – The Bushsports Amazing Races Sydney Trophy! 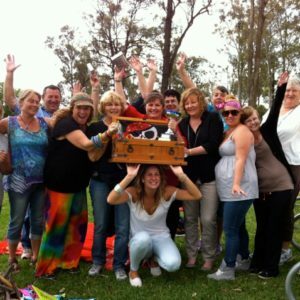 Engage in quality Fun Sydney Team Building activities customised to your group of raggamuffins and eccentrics to enjoy. Our staff will come to your offices. Allowing you to launch your race direct from corporate board rooms, conference centers, hotels and restaurants everywhere. The Shangri-La, The Four Seasons, The Park Hyatt. We enter the classiest of establishments with confidence and have your staff up and active! Sydney amazing race fun team exercise for good health team building activities corporate events through The Rocks. Select your Races level to test your teams skills. Bringing out the wicked, wiley, fancy or flightful. Experience a race that excites as well as engages all individuals to participate. Finally a program for corporate groups and friends social groups with amazing challenges that rewards excellent performance. Transport on Sydney Amazing Races can include: walking, runnning, taxis, Sydney monorail, Sydney Harbour Water Taxis, Jet Boats, Bicycles or ferries. Note to date we have included Hummers, Harleys, Helicopters, Submarines, Sailing Yachts, Segways, Quad Bikes, Motor Bikes, Scooters and Pogo Sticks!!!! 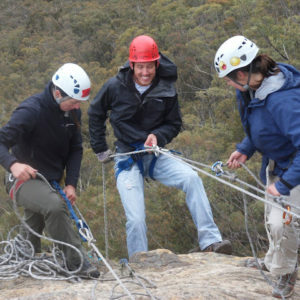 Get active with Bushsports: The Sydney Adventure Activities Specialist! How is it DONE? Professional team event coordinator launches your teams Sydney Amazing Race engaging your staff, friends, and clients. Detour –Teams select 1 of 2 challenges each with their own pros and cons. 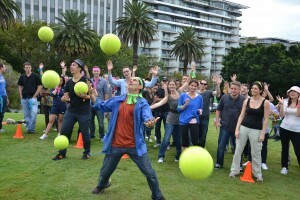 Sydney amazing race fun team building team activities ball juggle frantic exercise – which one? Select a Cultural Eating experience Challenge– Bizarre or Sweet Treats for an easy to swallow option. Intersection – Creative Team Building Challenge – caricatures drawing out Interactive Insight. Roadblock – Physical Fun Team Challenges – Fun Mini Olympics relays where the whole crew and teamwork is vital. Lateral Thinking Team Challenge – Teams complete a Puzzle or Mastermind task. Circus Tricks & Just for FUN team Challenges – humour, enjoyment, team laughs! Team Mystery Decode Challenge – Teams select 1 of 2 challenges in a Detour. We will organise a selected venue for prizes and presentations. Sydney Jet Boating for corporate incentives & Team Building – Amazing Race Thrill, spins and power spray stops on Sydney Harbour. Sydney Luna Park fun team building activities in Coney Island, The Ferris Wheel, The Rotor, Slippery Dip or Pirate Ship Just for Fun! Sydney Water Taxis crossing Sydney Harbour beneath Sydney Harbour Bridge or around Sydney’s Shark and Clark Islands for Amazing Race clues. Sailing Regatta Sydney Harbour, Amazing Race Team building aboard yachts to race from Rushcutters Bay, Darling Harbour or Lavender Bay. Taronga Zoo or Darling Harbour Wildlife World; amazing team building experiences for international conference delegates. Experience native Australian wildlife from across the globe up close and personal!! Sydney amazing races checkpoint with a mental strategy. Can your team succeed the master mind? Enjoy bringing out the creative team qualities with artistic caricatures within Sydney’s NSW art gallery, Museum of Contemporary Art or in Hyde Park. Conduct team maneuvers and team building missions at Milsons Point. Sing an operatic team song with marvelous performances by the Sydney Opera House. Marvel Sydney’s unique architecture in Martin Place. Rock on down to Sydney’s historic quarter The Rocks for a convict gang chain line up or team drinking challenge! Inspire your teams energy in Sydney’s Luna Park, just for fun! Share Sydney cultural team experiences in China Town. Ascend Sydney Tower or to Sydney harbour Bridge Pylon or The Glenmore Hotel. Steal a glimpse of the Queen in Sydney QVB. Taxi down George Street Sydney by Town Hall. Bowl at King Street Wharf Darling Harbour or Strike Bowling Bar, Pole Dance with Divas, Complete fun circus Tricks and skills. Experience Sydney flavour, beaches and bars. No special skills, athletic ability, or previous experience required. Designed to experience Sydney’s unique features in a really amazing way. Amazing Race Teams navigate Sydney city CBD strategically, problem solving, collaborating and achieving points to win The Sydney Amazing Race Champions Trophy and receive special prizes. 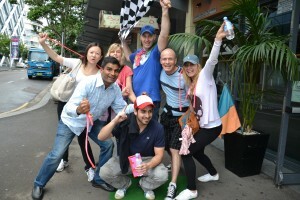 Sydney Amazing Race Content is customised to suit your teams requirements. Incorporate your company’s mission, values and integrate your core business ideals. Proven professional team development programs. 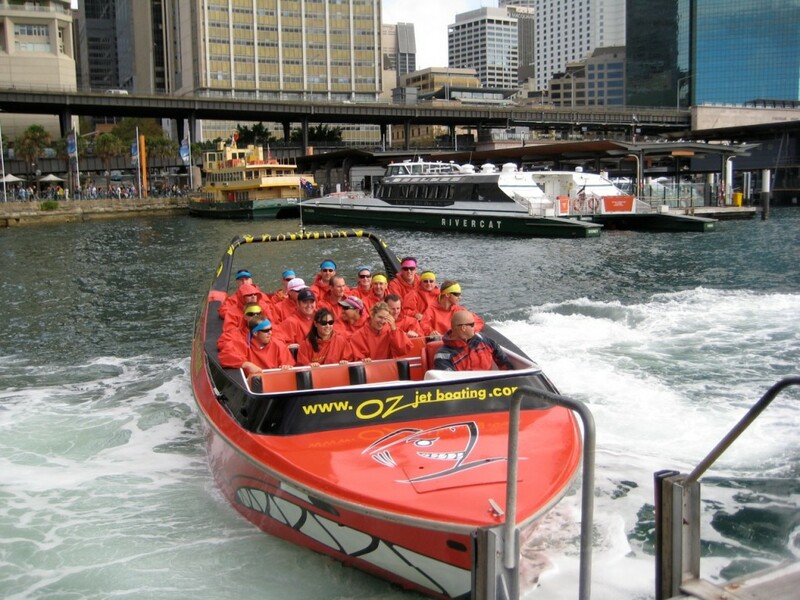 Sydney amazing race – Jet boats can add the THRILL wow Factor. Great races around Parramatta for Corporate Groups. Great races in and around Sydney Olympic Park venues. Bushsports customises events in all locations in Sydney and Australia wide. “We all had an amazing day. We showed that we had excellent communication skills, interacted well together, supported and helped each other, and had a lot of fun along the way. There was a great mixture of challenges and all skill levels could participate”. Bushsports Amazing Races in Sydney are professionally developed, proven and endorsed by; Coca Cola, Mirvac, Crowne, AGB Nielsen, Vero, Du Pont, Nickelodeon, Red Bull, CBA, APRA, Orix, Optus..
With more than 1,000 Amazing Races conducted, we are bound to be able to deliver an exceptional program for your team or group. Sydney Team Building Activities that are well Balanced – With Cerebral, Physical, and Creative Team Games Awarded Points. The Bushsports Amazing Team Building Race is a reality teambuilding game show in which teams of 2-8 people, who have some form of a preexisting business relationship, race around Sydney. 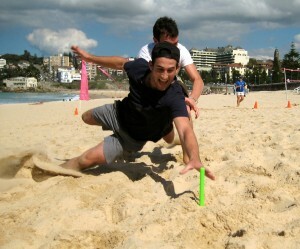 Sydney Amazing Races Beach sand dive – Commitment and Eyes on the prize to win! An Amazing race may have teams travelling to The Blue Mountains, Central Coast or any selected location in a competition with other teams. Contestants strive to arrive first at “challenges” at the end of each leg of the race to win prizes and to avoid coming in last, which carries the possibility of elimination or a significant disadvantage in the following leg. Contestants travel to and within multiple checkpoints with a variety of transportation modes, including taxis, jet boats, planes, balloons, helicopters, trucks, bicycles, taxicabs, personal car, trains, buses, ferries, kayak or by foot. Amazing Race Sydney Clues provided in each leg lead the teams to the next destination or direct them to perform a task together. Great Race challenges are related in some manner to the country wherein they are located or its culture. Teams are progressively scored until the PITSTOP is reached at that point, the team with the most points is awarded the grand prize; a Sydney Amazing Race Trophy. Teams may compete, and at times cooperate, at iconic relived experiences from the CBS Amazing Race. Incorporated in the Sydney Amazing Race program is Building team morale, strengthening leadership skills! Select any Sydney locations, restaurants, cafes, rooftops, and Sydney pubs. Or have us customise Sydney Amazing Race content to meet your individual requirements and team building needs, then watch as we exceed your expectations! The finale, is racing for the Pitstop. Here, the whole team reunite for debriefing, presentations, drinks, prizes and be awarded your engraved Champions Trophy. Select a Team Development or Social Group Activity and Take Advantage of FREE Offers! BOOK NOW! to receive a FREE Photographic Package – capturing your team building action.